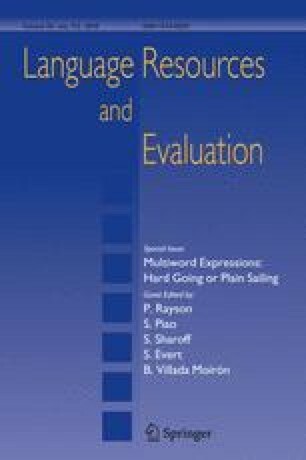 We describe annotation of multiword expressions (MWEs) in the Prague dependency treebank, using several automatic pre-annotation steps. We use subtrees of the tectogrammatical tree structures of the Prague dependency treebank to store representations of the MWEs in the dictionary and pre-annotate following occurrences automatically. We also show a way to measure reliability of this type of annotation. This work has been supported by grants 1ET201120505 and 1ET100300517 of Grant Agency of the Academy of Science of the Czech Republic, projects MSM0021620838 and LC536 of the Ministry of Education and 201/05/H014 of the Czech Science Foundation and a grant GAUK 4307/2009 of the Grant Agency of Charles University in Prague. Pajas, P. (2007). TrEd. http://ufal.mff.cuni.cz/∼pajas/tred/index.html.